Do you what you want to achieve the goal of burn your body fat and gain muscle mass then read and learn about the top 5 protein foods. These 5 protein foods are not a secret, but rather the majority of people do not know these foods are a great source of proteins that are vital for muscle growth. During training, we all exercise our muscles but we often forget nutrition. To improve and increase our muscle weight, we have to eat lots of protein and burn fat. Remember that proteins build and develop the muscles and should be part of your diet. Chicken breast is the number one source of protein and the best thing is that it also contains little fat. Usually it is better to eat the breast that the legs because it has more protein and less fat. 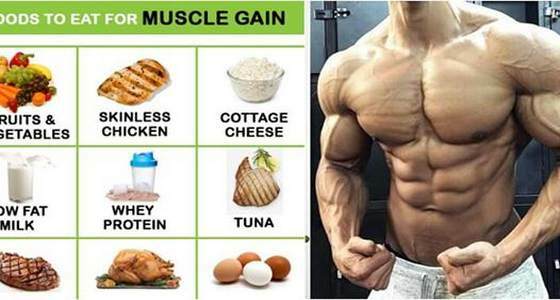 Chicken is the best food for the growth of better muscles. Eat it roasted or grilled but not fried because it reduces the amount of fat. Fish (tuna, salmon, etc.) is high in protein and will help gain and build muscle. Fish has a little more fat than chicken, but either way is necessary for the body fat, but with moderation, and in combination with protein helps muscle growth. Any grilled fish is very good and also eat tuna and sardines. Red meat red meat is also high in protein but also high in fat, and not exactly good opposite to the fish, which is why this third in the list. To reduce fat from meat and take advantage of the protein, it is necessary to remove all the fat possible and grilling is the best cooking option. These 3 are part of the food pyramid and contain a great source of protein, which is why they are part of the TOP 5 protein foods. It is usually recommend to remove the egg yolks because they contains more fat and cholesterol, but from time to time take all the whole egg, which is fine. Whey protein is the best source of protein in the market for dietary supplements. It comes in different flavors and colors and is dissolved in water or milk and usually taken liquefied or shake style. These supplements are usually high in calories, so be prepared to have a muscular body and volume after eating these TOP 5 Protein Foods because it really promote true muscle growth.